The Blue Angels flight demonstration squadron was formed to improve Navy and Marine Corps recruitment and represent their aviation department to the U.S. Armed Forces and to other countries. It was the Blue Angels US Navy squadron that used the F/A-18 Hornet since 1986. Developed and produced by McDonnell Douglas (now called Boeing), the Hornet was a twin-engine, all-weather, and carrier-capable multirole fighter. The F/A designation speaks for the missions this plane is designed for—dogfighting and attacking ground targets (F for Fighter and A for Attack). On April 2, 1980 the first production F/A 18A Hornet took its maiden flight. After producing 380 units, production shifted to the next variants. The F/A 18 Hornet A and B models are usually flown by the Blue Angels at air shows and other special events not only in the US but also worldwide. The A variant was also seen in important operations such as in Southern Watch, Enduring Freedom, and Iraqi Freedom operations. If you’re impressed by how the F/A-18A Hornet appears on air shows, then you can enjoy that moment again by getting this excellent-quality aircraft replica of that dream plane of yours. Sculpted by expert model makers with over 30 years of industry experience, you are assured of master craftsmanship and a scale model that’s of museum-quality. This model aircraft is hand-painted and finished according to factory drawings, so even the smallest details of the original are accurately copied. 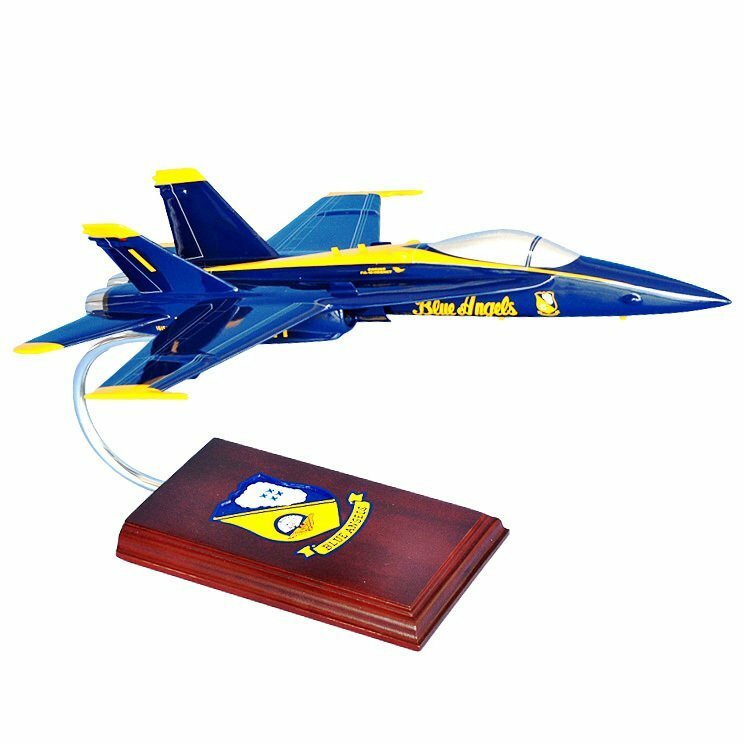 It is boxed with hand-cut foam layers, so whether you’re purchasing it as a reward for yourself or you’re sending it as a gift to someone else, this desktop model aircraft will surely get to your nominated address in tiptop shape.